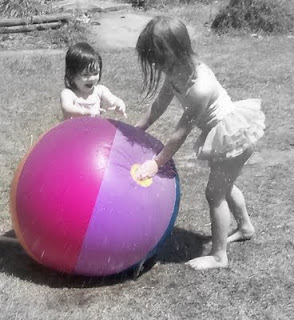 Homemaker Highlights: What do your children like to do for fun? What do your children like to do for fun? First, I would like to say that I found an awesome blog. If you have not yet had the pleasure of reading Stephanie Nielson's NieNie Dialogues....I highly suggest her blog. She's just an awesome and beautiful person...inside and out. I got to see her interview this morning (along with their family) on Glenn Beck. Just absolutely amazing, inspiring, and encouraging. She has a blog going on now called "What do your children like to do for fun?" I would have to say my Chickaroo Sisters have a top 2 favorite fun things to do list. 1. I would have to say the water. They are true water bugs. 2. They love the outdoors and anything that goes along with it. 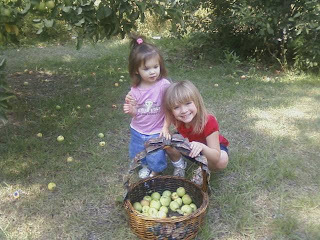 This Summer they have enjoyed picking apples from our back yard and their swing set.